Caesar's plans to lead his people to freedom are thwarted by a ruthless human military leader. After Tim Burton's failed 2001 attempt to reboot the Planet of the Apes franchise, Rupert Wyatt pulled it off with some style in 2011's surprise hit prequel Rise of the Planet of the Apes. After such a high, its 2014 sequel, Dawn of the Planet of the Apes was a minor disappointment, thanks chiefly to the bland and uninspired direction of Matt Reeves, which rendered it not unlike an episode of an expensive TV show. 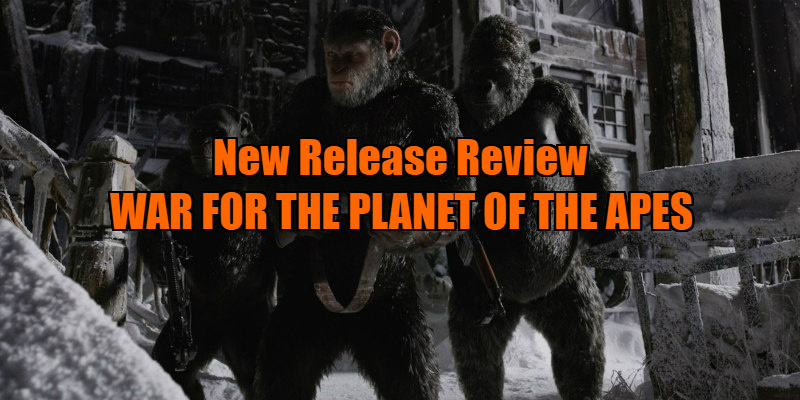 It's difficult to believe that the same director is responsible for the latest installment, as War for the Planet of the Apes is one of the most cinematic movies to come out of Hollywood in decades. The Tim Curry of the digital age, Andy Serkis returns to what has become his signature role, that of Caesar the ape, whom we meet here leading his people against an attack from a group of human soldiers (the precursors of Beneath the Planet of the Apes' bomb-worshipping mutants) against their forest home. Quelling the invaders, Caesar takes some of the humans prisoner, releasing them back to their people in the belief that such an action will send the message that the apes simply want to live in peace. It turns out to be a Neville Chamberlain level of naivete however, as that night the soldiers return, led by Colonel McCullough (Woody Harrelson), who murders Caesar's wife and eldest son. While his tribe sets off in search of a sanctuary across the desert, Caesar and a small band of fellow apes attempt to find the humans' base and exact revenge. The modern blockbuster is in a sorry state. Critics tie themselves in knots to praise big budget movies that would play as effectively on a laptop as on an IMAX screen. Sure, Spider-Man: Homecoming is a fun teen comedy and Wonder Woman is a welcome reprieve from male-dominated blockbusters, but both are visually uninspiring, and directed in the blandest fashion imaginable. In contrast, War is an arthouse movie, Mel Gibson's Apocalypto remade with monkeys (Ape-ocalypto?). With the film boasting no more than three scenes involving spoken dialogue, watching Caesar lead his people to paradise is like discovering some lost biblical epic of the silent era. War is so unconcerned with commerciality that it's a miracle a major Hollywood studio could release it in 2017, a time when directors are being fired off projects for daring to express a vision and studios are displaying an active disinterest in working with auteurs. Few would call Reeves an auteur, which may explain how he was able to pull this off. I certainly never expected the level of craft and artistry on display here, the sheer commitment to visual storytelling, or the shunning of overblown fake spectacle in favour of drama that plays out on the faces of the film's CG rendered simian heroes. Ironically, for a movie with the titular designation War, there's very little in the way of action sequences here, but the few we get are quite something. The opening Vietnam inspired sequence is as visceral as the beach landing of Saving Private Ryan, arrows raining down in a rain-soaked hellscape. Like Gareth Edwards, Reeves isn't interested in large scale spectacle here, preferring to make small moments spectacular. When the humans return for a second attack, Reeves keeps them largely obscured, visible only by the green laser sights of their guns penetrating through the foliage. It has the effect of making the humans alien and other-worldly, helping us to accept the apes as the film's heroes. The weakest part of the previous movie was the unconvincing band of humans who ally themselves with the apes. Here, save for a mute young girl (Amiah Miller), every human is a villain, another daring move from a movie that isn't willing to make any concessions to popular studio beliefs of what audiences wish to see. Who needs them when you have CG creations as endearing as this bunch - particular mention must go to Steve Zahn's performance as 'Bad Ape', a comic relief supporting character that never veers remotely close to Jar-Jar Binks territory. But at the same time, we still understand why the humans see the apes as a threat, as the film lays down the groundwork for explaining why in the 1968 original, humans have regressed to a near neanderthal state. At 140 minutes, with little in the way of conventional action and playing out chiefly through a combination of silent gestures and subtitled simian-speak, War will prove a test of patience for the average cinemagoer weaned on Marvel and Transformers, for whom it will likely be as accessible as a Bela Tarr drama. For those who appreciate pure cinema, stories told through pictures rather than words, War is a rare opportunity to revel in the previously untapped possibilities of the modern blockbuster format. 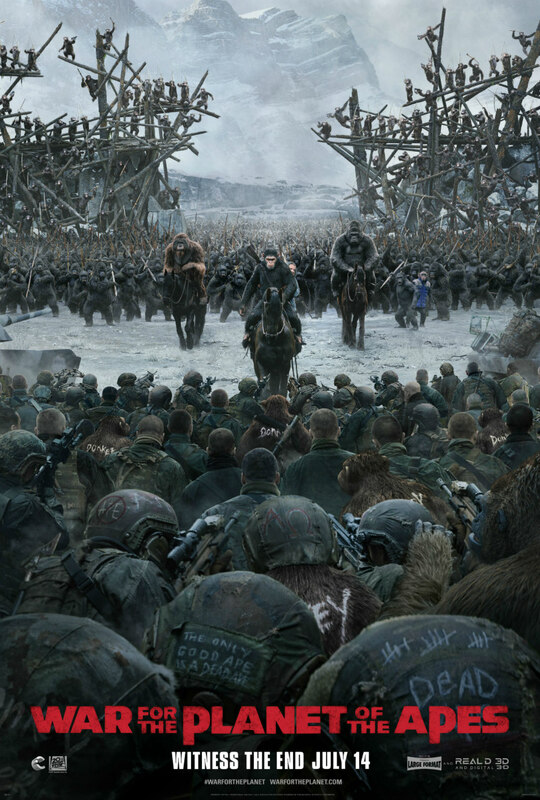 War for the Planet of the Apes is in UK/ROI cinemas July 11th.